These Dell PowerVault SAS SAN arrays provide scalable, yet cost-effective storage capacity expansion for multiple server hosts with growing applications. These units provide enhanced storage management capabilities to allow for shared storage for small clusters, or to dedicate a certain amount of storage to a particular host. These options are a great choice for the small to mid-sized business or enterprise remote site that needs fast and highly available shared storage between a small cluster of servers, without having to create a network storage environment. Dell PowerVault arrays keep storage costs low and support either high performance SAS or low cost SATA drives, allowing you to choose the proper performance and cost point for your business requirements. 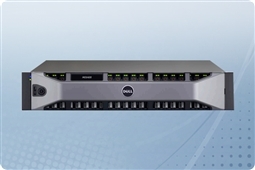 The affordable Dell PowerVault MD3000 provides a 3Gb/s throughput backplane, while the MD3200 and MD3220 provide a 6Gb/s backplane for higher throughput and greater performance in more demanding environments. Curious which Dell PowerVault SAS SAN (Storage Area Network) arrays are best for your business continuity and budget? Check out our Survival Guide: Avoiding A Data Apocalypse today! 6TB (6 x 1TB) 7.2K 12Gb/s NL SAS 3.5"